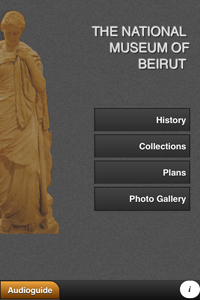 Ourjouwan.com - NATIONAL MUSEUM OF BEIRUT. 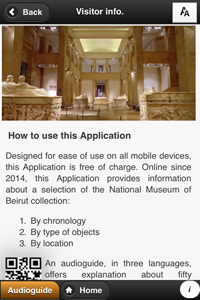 NATIONAL MUSEUM OF BEIRUT is an application developed by Ourjouwan.com in collaboration with the Ministry of Culture of Lebanon / Directorate General of Antiquities. 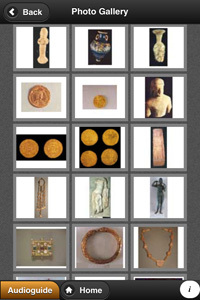 Created and compiled with careful regard to reflect the rich heritage of the museum. We believe that the context in which we present the material is important to understanding it, and we will improve, modify, enhance, and expand the Application on a continuous basis. 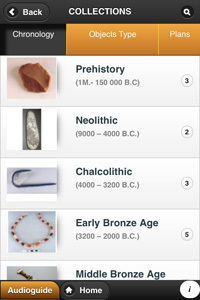 An audioguide, in three languages, offers explanation about fifty masterpieces of the archaeological collection on display in the National Museum. 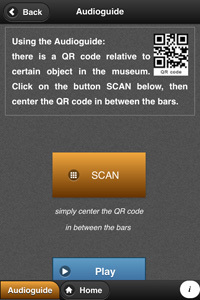 You will find a sign, a QR code, near the artefacts which are part of the course of this tour. You are kindly requested to direct your phone toward the sign displayed near the selected objects and the explanation will automatically start.